The 57th annual Archery Tournament between Sherwood, Oregon and Nottingham, England took place July 21-22, 2012 at the Sherwood Elks Lodge. 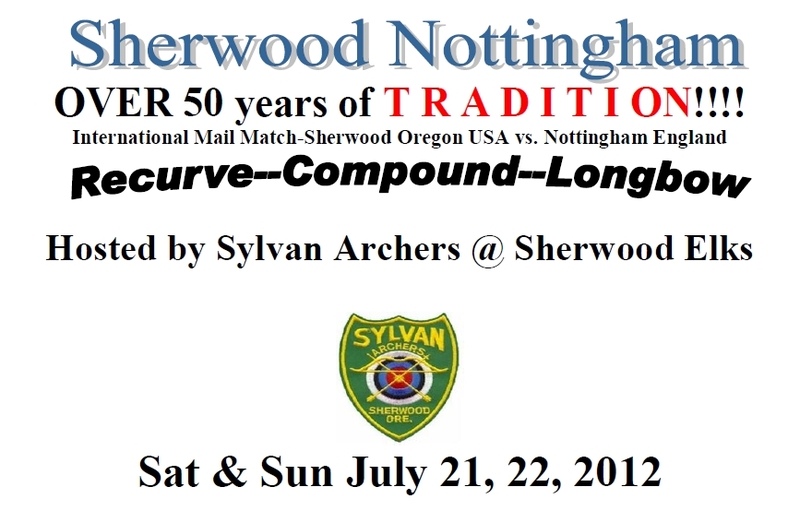 We are proud to announce that the Sherwood, Oregon archers were victorious in the 2012 competition! The 58th annual tournament will take place July 20-21, 2013. Archers will compete in both locations in similar time frames (accounting for time differences), communicating their results. 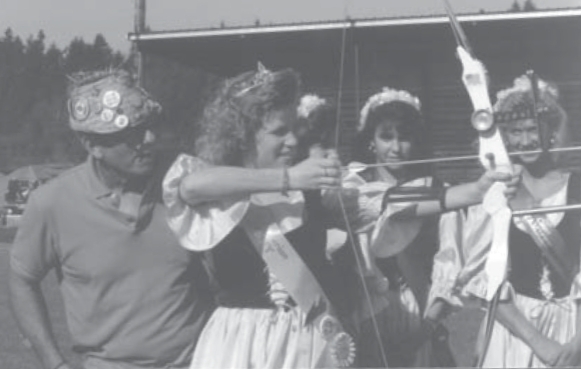 Competition will be held from 9 AM to 3 PM both days, with Maid Marian shooting the first arrow during Opening Ceremonies 8:30 AM on Saturday, July 21. The Awards Ceremony will be held 2:00 PM on Sunday, July 22. 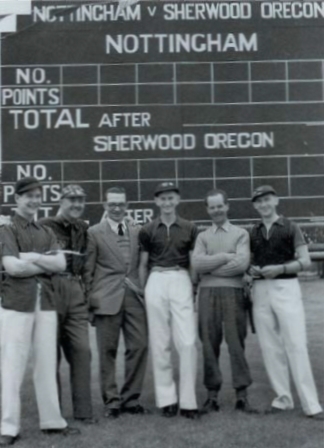 Two medallions, one from Sherwood and one from Nottingham, are presented to each member of each division team, and the winner of the silver Tiffany bowl traveling trophy is announced. The competition for the silver bowl takes place in the Senior Recurve division. There will also be competitions in the Junior Recurve, Compound and Longbow divisions. This year, two new divisions will be offered: Master Recurve and Master Compound for archers 50 years of age and older. Visit the Sylvan Archers Nottingham Tournament Page for more information. Pre-registration should be submitted to the Sylvan Archers, not to the Robin Hood Festival. Pre-registration deadline is July 15. It is suggested you pre-register early since the tournament is limited to 80 archers. Pre-registration is recommended but not mandatory. Note that the Robin Hood Festival activities take place July 20-21 in Old Town Sherwood, located approximately 2 miles away (a short 5 minute drive) from the Sherwood Elks Lodge range. Sherwood, Oregon issued an archery challenge to the yeomen of Nottingham, England. The archers would come from the entire Northwestern part of the United States. In order to cement their bond with the people of Nottingham, England, Sherwood sent 50 redwood oak trees as a living memorial. round would be 90 arrows at the distance of 60, 50 and 40 yards, and would follow the F.I.T.A. equipment rules. 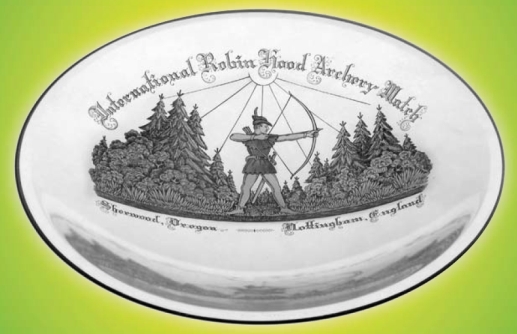 In July 1956, a picture of the silver Tiffany bowl trophy donated by the Robin Hood Festival Association donated to the International Robin Hood Match was sent to Nottingham, England, along with rules on how they were going to communicate during the shoot. Both competitions were to happen on the same day, but due to time differences, England was shooting eight hours later. This was the first competition. The Mayor of Sherwood has sent a challenge every year since. The silver Tiffany bowl was engraved by Mr. Stefans Bercs’, a master Engraver. Mr. Bercs’ reputation is worldwide. He is known for engraving for the Court of the Czar of Russia and other notables. In the 1980's, the tournament changed to a double 900 round a perfect Score 1800, and the four person Compound team was started. In the 1990's, the compound team was changed to an eight person team. The four person Longbow team was also started. There was also a renewed interest in the Junior four-person team.